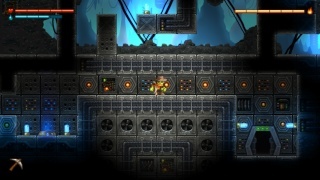 Developed and published by Image & Form SteamWorld Dig is a sprawling Metroidvania style game that focuses on treasure hunting in a randomly generated underground world, but is the game a gem itself or just a hunk of scrap metal? Keep reading to find out! The gameplay is simple, you must find treasure and bring it back up to the surface in order to earn money and upgrade your town. The more you upgrade the town, the more new upgrades and items to purchase will become available and the further you'll be able to dig before your all-important lantern runs out! The enemies in the caverns are quite tricky to beat if they catch you off guard so keeping your lantern lit is extremely important so be sure to upgrade it often. The treasure in the game is easy to find thanks to how much they stand out in the ground. There are also dungeons that can be entered at certain points in the caves and these typically require puzzle solving to fully explore, but they often possess important items that you'll need to beat the game! In-terms of replay value this game is amazing! The entire world is randomly generated at the beginning of each playthrough of the game so no two playthroughs will be the same! The controls in SteamWorld Dig are silky smooth and exceptionally easy to learn and the Off-TV Play is a very enjoyable feature, however it would be nice to have been given the option to use the Wii U Pro Controller or the Wii Classic Controller Pro, but it's not a major complaint. Graphically the game looks crisp and vibrant while still possessing a decidedly retro charm that looks amazing! Some of the background images look simply gorgeous. In-terms of audio the music is quite good and fits the game's western theme quite while while the sound effects are varied and reminiscent of an SNES title! All-in-all the audio-visual visual aspects of the game are excellent! 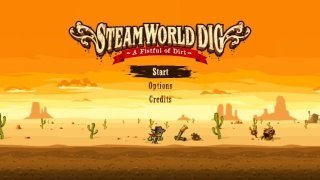 With great gameplay, excellent controls and superb visuals and music SteamWorld Dig is an amazing title for the Wii U eshop that is worth every penny! While the randomly generated world adds an unlimited amount of replay value to the game! We can't recommend this amazing title enough, so do yourself a favor and download SteamWorld Dig for the Wii U eshop today! Spelunker meets Metroid about sums up this terrific game! Good review. This is a decent game though I feel that your score is a little high. This game is awesome. Great review Rukiafan! 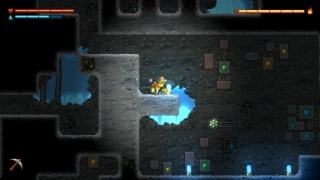 SteamWorld Dig is fun! Great review. @Tsukoko wrote: Good review. This is a decent game though I feel that your score is a little high. His score is spot on! It's a great game but I can understand it's not for everybody. I found this game boring, but good review nonetheless. Thanks for the feedback everyone! My next review is Spin The Bottle: Bumpies Party which goes live tomorrow, followed by my review of Castlevania III (NES) for the (Wii U VC) which should go live on either Monday or Tuesday. I bought this for my 3DS and was immediately hooked! This game is going to have to wait for me to purchase it on my WiiU though. This is why Nintendo needs to support crossbuying! This was a day one purchase! I have it for 3DS, but I never got around to playing it a lot because I play on my Wii U more lol. Excellent game. I won't be getting this version because I already have it for the 3DS and Vita!